It was one of those perfect late summer days. Blue skies, a gentle westerly blowing in English Bay and a new sailboat to put though its paces. Problem was, on this kind of day, one wants to keep on sailing, not turn around and head back after only a few hours. Such was the case of the versatile Beneteau 38.1 when Grand Yachts broker Dave Worland and I went out—the sailing was easy and I didn’t want to return. The Beneteau 38.1 is a modified version of the Oceanis 38. 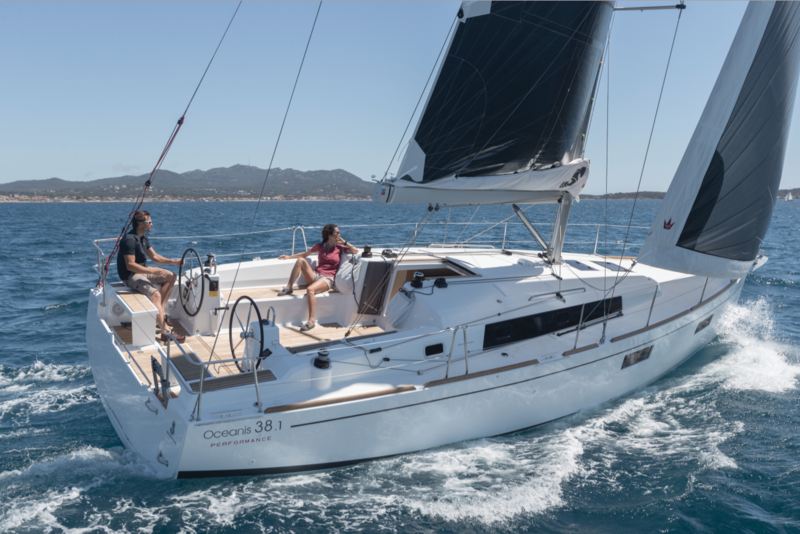 The Oceanis line has the largest number of sailboats in the Beneteau line, with 10 models starting at 31-feet (9.6 metres) and topping out at 60 feet (18 metres). The “.1” designation is given when a particular model has been updated. Design The 38.1 is available in six interior configurations and this makes it extremely versatile and therefore attractive to variety of tastes and uses. The basics of the 38.1 remain the same as its predecessor. There’s the proven, plumb bow and 39-foot, nine-inch (12.1-metre) chined hull by French naval architect Finot-Conq. With the full 13-foot, one-inch (four-metre) beam carried pretty well to the stern, the designers have maximized interior space. Beneteau says the hard chines make for a more stable platform than traditional rounded hulls. Other major features carried forward are the twin helm stations, twin rudders, an optional mainsail arch and a large retractable swim platform. There are also both shallow (five feet, five inches/1.64 metres) and deep draft (six feet, 10 inches/2.09 metres) versions with cast iron keels, though in our waters, customers are likely to go deep draft, as was the case with the test boat. There are also some noticeable changes to the Nauta Design interior. For added privacy, there is now a fixed bulkhead with double doors between the saloon and the owner’s V-berth. When the two doors are open, they offer unimpeded views to the bow, which makes the interior space appear larger. Another significant change is an optional L-shaped galley to port instead of the standard linear galley to starboard. In addition, the navigation station has been moved to the starboard side and the desk can now be folded out of the way. Thanks to parent company Groupe Beneteau, which lays claim to being the world’s largest boat manufacturer, the company has a separate, dedicated research facility to keep them on the leading edge of technology. It is here that scientists build things and then try to destroy them. Currently, all Beneteau sailboats up to 45 feet are built in the USA, at Beneteau’s Marion, South Carolina plant. On Deck The transom is essentially a drop-down swim/boarding platform. It is a generous eight feet, six inches (1.7 metres) wide and easy to deploy. It opens manually to reveal a recess in the stern to store a life raft or other goodies. When closed (by pulling on the telescoping swim ladder) it creates a raised lip—like a toerail—across the transom for safety. When deployed, there’s still plenty of room to move back and forth between the twin helm stations. Seating for the helmsperson is on the outside cockpit coaming, which, thanks to the wide beam, allows for good forward visibility. A hinged propane locker is located under the starboard side coaming while two very generous storage lockers are accessed under the sole. Thanks to its generous beam, the cockpit is wide and spacious, with teak on the sole and cockpit seats. There’s an option for a large teak cockpit table, but it was not ordered on the test boat. This should be a must for open-air dining and for support when walking in the cockpit. Under the starboard cockpit bench seat is a large storage space. Should the yacht be ordered with a storage area instead of a starboard aft stateroom, it would provide access down to that storage room. Sturdy, well-placed handrails on the mainsail arch, dodger and cabin top make it easy to move forward. I also like that there are midship cleats, which makes it easy to dock with a breast line, instead of bow and stern lines. Port and starboard gates allow boarding from either side. Up on the bow the pulpit is open with a single anchor roller, optional electric windlass and deep anchor locker with lots of extra space. The test boat was fitted with a locally made dodger (La Fabrica). A standard dodger is available from the factory, but there’s an advantage to having a high-quality custom product that can be repaired or modified locally. Rig and Sails The cabin top is tidy, with two opening hatches and exposed control lines that run aft from the mast. The aluminum rig is 9/10, 14 metres (46 feet) tall and deck-stepped. The test boat had the optional in-mast furling (lazy jacks and a lazy bag are standard). The rigging is stainless with two aft-swept spreaders and a split backstay. The test boat was equipped with a 103 percent furling genoa. Other sail options include a self-tacking jib, asymmetric spinnaker and code zero. Most buyers will likely want to order at least the genoa and a code zero. Excepting the genoa sheets and the genoa furler, all the other controls (except the topping lift which is at the mast) lead aft to the port side of the companionway where there’s a single Harken 35 self-tailing winch and four sheet stoppers. The genoa sheets pass through traveller cars on tracks mounted on deck and then back to Harken 40 self-tailers just forward of the helm stations. The mainsail arch is an option, but an excellent one as it keeps the mainsheet/traveller out of the way. To keep things simple, the mainsheet incorporates two fixed stand-up blocks on the arch instead of an adjustable traveller . Interior Hinged, smoked-glass doors and a sliding hatch provide access below. The gently sloping molded fibreglass stairs are hinged to allow access to the engine. The interior décor is a mix of blond oak Alpi wood, dark laminate flooring and light brown accents and fabric upholstery. However, dark mahogany Alpi is standard. Cabin and hull windows, and an overhead hatch bring in plenty of light and the doverhead hatch and opening ports in the cabin windows should bring in adequate ventilation. There’s good storage under the starboard bench seat, in numerous drawers and cabinets and under the floorboards. There’s six feet to six feet, five inches of headroom throughout the interior. The test boat had a Webasto forced air diesel heater—pretty well a must in our waters. Each of the six layouts comes with a single head. The master stateroom in the bow is the same, regardless of layout, but customers can choose between single or twin aft staterooms. There’s also the choice of a linear or L-shaped galley. The test boat had twin aft staterooms and an L-shaped galley. With this configuration, there’s a settee to starboard instead of a linear galley and the settee faces a second linear settee across to port. A sturdy, fixed, two leaf folding table is positioned between the settees. There’s room for eight to sit at the table and half a dozen bottles can be stored in top-loading racks in the table. With this interior arrangement, the nav station has been moved to the aft end of the starboard settee, and the desk portion folds up out of the way. The L-shaped galley comes with a two-burner propane stove and oven and a 100-litre top-loading refrigerator/freezer unit. There’s good storage in overhead cabinets and in cupboards and drawers underneath the counter. To the left of the stove is a hinged countertop with plenty of storage for dry goods underneath. The master suite in the bow features a full-width double berth, a hanging locker to starboard and a cupboard with shelves to port. There’s more storage in a drawer at the foot of the bed. An overhead hatch and large hull windows make this a bright spot. The two guest staterooms have hull windows with opening portholes, ample (2 m/6’ 7” long) fore and aft berths, padded upholstery along the hull, hanging lockers and open shelves. There’s also easy access to the sides of the diesel. For those opting for a single portside guest cabin, it is considerably larger and comes with an athwartship berth. The molded fibreglass wet head on the test boat had a vanity, manual flush head, shower nozzle and storage in various cabinets as well as an opening port for ventilation. With other configurations, there are options for a separate shower. Underway Power is via a 30-horsepower Yanmar diesel with sail drive and three-blade fixed prop. The engine panel and controls are on the port steering pedestal. The main instrument panel is here and it features a seven-inch B&G multifunction display, the B&G autopilot control and the bow thruster (optional) control. The starboard pedestal has a smaller B&G readout. The test boat was fitted with the optional bow thruster, which of course makes it easier to dock. With twin rudders and the saildrive between the two, steering is slightly different than standard—where a saildrive is located directly in front of a single rudder—but that’s not an issue once one learns to be a bit more aggressive with the throttles when docking. As we powered out under the Lion’s Gate Bridge our speed was 7.4 knots through the water at a fast cruise of 3,000 rpm. At wide open throttle and 3,500 rpm, we were making 8.1 knots. Out in English Bay, the genoa and mainsail unfurled easily. As winds were light, it was difficult to capture an accurate performance picture. However, close reaching at a true wind angle (TWA) of 64 degrees and a true wind speed (TWS) of seven knots, we were averaging about 4.2 knots. With a TWA of 90 degrees and a TWS of 8.2 knots, we were averaging about six knots. When the winds increased to 12.5 knots and our TWA was 110 degrees, or speed increased to 6.6 knots. Ideally, we would be flying a code zero under these conditions, but the test boat was not so equipped. The mainsheet is at the forward end of the cockpit and the genoa sheets just forward of the twin helm stations—and a bit of a stretch to reach from behind the wheel. When tacking, we were able to simply leave the mainsail cleated and simply deal with the genoa sheets. The twin rudders gave us precise steering and the 38.1 tacked and tracked well. Visibility ahead was good, thanks in part to the wide beam aft. Overall, the 38.1 is a very easy yacht to sail. While no race boat, it is no slouch and it certainly qualifies as well-performing cruiser. Concluding Remarks The 38.1 is not a complicated yacht and because there are six possible layouts, it will appeal to a wide variety of users. Being simple to sail, it will be attractive as a “first” sailboat for families or for older couples looking to downsize from a larger, more complicated yacht. It is certainly suitable for both day sailing and extended cruising. And lastly, it will appeal to those looking to charter, thanks to its three staterooms. Price as tested was $299,950 Cdn.